Democrats want U.S. ownership stake in firms it helps. Industry wants plan to cover other kinds of debt. What should Congress do with the $700 billion proposal to take pressure off the credit markets? Senate Banking Chairman Christopher Dodd (l) and Sen. Charles Schumer speak to reporters about a proposed $700 billion bailout of financial markets. NEW YORK (CNNMoney.com) -- On the day of the first public discussion between lawmakers and the administration about the Treasury's $700 billion financial rescue proposal, the debate is being framed by a few key issues. Dodd's committee will hold a hearing on the bailout on Tuesday morning. The House Financial Services Committee will do the same on Wednesday. 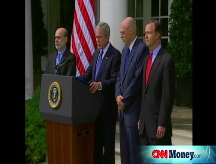 Paulson and Federal Reserve Chairman Ben Bernanke are scheduled to testify at both hearings. Many lawmakers seem to be on board with giving Paulson the authority he seeks, but they want to add a few provisions. Senate Democrats circulated a counter proposal on Monday that would require the government to receive an ownership stake in the companies it helps. The proposal, offered up by Dodd, would require companies who sell assets to Uncle Sam to give the government shares in the company, according to a draft obtained by CNN. The Senate Democrats' proposal would also require the government to come up with "a systematic approach for preventing foreclosures and ensuring long-term, sustainable homeownership through loan modifications and use of the HOPE for Homeowners Program" on the mortgages it buys in the bailout. The Dodd proposal calls for curbs on executive compensation and a change to federal law so that judges can modify a bankruptcy filer's primary residence mortgage. Under current law, judges may only modify loans on second homes. The lending industry has strongly opposed such a provision. Lastly, the Dodd proposal would terminate Treasury's special authority to buy up troubled assets by Dec. 31, 2009. By contrast, the Treasury's proposal calls for termination two years from the date of enactment. In a briefing with reporters on Monday, House Financial Services Committee Chairman Barney Frank, D-Mass., said he is finalizing a counter-proposal and that his plan is "very close" to Dodd's. Meanwhile, the Bush administration is pushing for a "clean" bill to be passed quickly and not be loaded up with provisions that would deter companies from participating. "[T]he whole world is watching to see if we can act quickly to shore up our markets and prevent damage to our capital markets, businesses, our housing sector, and retirement accounts," President Bush said. At the same time that congressional leaders are seeking provisions to protect taxpayers and troubled borrowers, financial institutions are weighing in with what they want in the bill. On Sunday, the Financial Services Roundtable - a lobbying group representing the nation's banks - called on Congress to make the plan "broad enough to include different types of assets." The Treasury has amended its original request to give it authority to buy up not just troubled mortgage assets, but troubled assets period. "Removing troubled assets will begin to restore the strength of our financial system so it can again finance economic growth," according to a statement on the Treasury Web site. The proposals being debated are the centerpiece of what would be the most sweeping economic intervention by the government since the Great Depression. The plan would allow the Treasury to buy up troubled assets from U.S.-based companies and foreign firms with big U.S. operations. The aim is for the government to buy the securities at a discount, hold onto them and then sell them for a profit. Experts liken the Treasury's plan to the Home Owners' Loan Corp., put in place in 1933 to stem foreclosures and help refinance defaulting mortgages and boost banks' liquidity. Given the magnitude of the Treasury's request and its long-term ramifications, lawmakers want to spend at least a little time debating the issues. And one key lawmaker, Richard Shelby, R-Ala., the top-ranking Republican on the Senate Banking Committee, indicated in a statement Monday that he's not going to be pressured into passing something that he fundamentally disagrees with. "In my judgment," Shelby said, "it would be foolish to waste massive sums of taxpayer funds testing an idea that has been hastily crafted, and may actually cause the government to revert to an inadequate strategy of ad hoc bailouts." - CNN producers Deirdre Walsh, Ted Barrett and Steve Turnham contributed to this report.